I. The examination of the problem concerning the creation, development, nature and downfall of the Pythagorean Community is not a matter that concerns only the philologist, the historian, the political scientist and the sociologist, but it is without doubt connected with the philosophical examination and understanding of Pythagorean doctrines and unquestionably involves the accepted activities of the specialist in political philosophy since testimonies of whatever nature need to be related to the hermeneutical approach and the philosophical evaluation of the Pythagorean doctrines. Moreover, in connection with the above, and given the nature of the existing evidence concerning the Pythagorean Community, the method judged to be the most suitable for the examination of the problem in question consists of putting forward and adopting (and, in consequence, rejecting) certain hermeneutical hypotheses by a process of reductio ad absurdum. 1. What were the reasons that led to the creation of the Pythagorean Community and where did this begin to take shape for le first time? 2. Were there various stages in the development of the Pythagorean Community and how can these be determined? 3. How was the Pythagorean Community organised and internally structured? 4. What kind of relations did the Pythagorean Community have with its social and political environment? 5. What was the ideological content of the Pythagorean Community? 6. What was the high point of the Pythagorean Community’s activities? 7. Was the Pythagorean Community an open or closed society or did it perhaps exhibit the characteristics of both, an open and closed society? 8. Why were there uprisings against the Pythagorean Community, how many uprisings were there and how should these be seen and interpreted? 9. Was there some error in the whole conception and in the structure of the Pythagorean Community that proved fatal for its course? 10. What was the chief contribution of the Pythagorean Community from a political and scientific point of view and what are the essential conditions for the unimpeded manifestation of the activities of the various Groups or Communities in the sociopolitical environment? II. Concerning these questions and in order to proceed to an examination of our topic, it is first necessary to ask ourselves which of the terms applied by the Neo-Pythagorean thinkers (primarily Porphyry and Iamblichus) is the most appropriate for describing what took place in the meetings of the Pythagoreans and, in general, for indicating the character of the Pythagorean movement. The terms used by later writers when referring to the Pythagorean movement are as follows: «community»1, «association»2, «meeting»3, «society»4and «sect»5. Each of these terms denotes a particular aspect: the term «sect» indicates both the fact that the Pythagoreans accepted a distinct body of doctrines and that they had chosen to follow a way of life in accordance with the dictates of these doctrines. From another point of view, the term «sect» implies something analogous to the term «school». The term «society» emphasizes the view that the Pythagoreans mixed among themselves and spent a great deal of time together, dealing with important matters. The terms «meeting» and «association» emphasize the collectivity, the group and discursive nature of the Pythagorean activities, while the term «community» denotes the peculiar nature of the rules and relations characterising the members of the Pythagorean organisations. The «community», which is the one most commonly used, can, according to the instance, take on the meaning of the term κοινότης or κοινωνία, without, of course, excluding any of the shades of the meaning of the other terms. In accordance, then, with the existing testimonies and in keeping with what has been said above, the Pythagorean organisations were of people, the members of which had accepted certain principles and doctrines, and who lived, thought, and acted collectively, and whose acts were dictated or related to the beliefs they had accepted. Moreover, as all the sources testify, the chief characteristic of the Pythagorean movement was secrecy 6. This had the meaning that it was not allowed to relate to those on the outside (in other words, to those who were not members of the Pythagorean Community) what took place within the Community, whether it concerned doctrines, or thoughts, meetings, decisions or achievements. The rule of secrecy that governed the Pythagorean Community right down to Philolaus presupposed the ability to remain silent and elevated silence to a form of virtue for the Pythagoreans, acquired it through practice7. However, it seems that this did not include either the identity of the members of the Pythagorean Community or their way of life, because then there would be no point in our speaking about a Pythagorean way of life8 that can be distinguishes from other ways of life. The Pythagorean way of life that can be distinguished from the other ways of life of the Greeks, not, we might add, in their form of life, but in their intensity, consistency and quality, i.e., it cannot differ totally9 axiologically and ethically from the way of life of the rest of the Greeks. Consequently the peculiar characteristics of the Pythagorean life must have differed only in certain points, which to have been related to the secrecy, the community of goods10 (which perhaps did not apply to all members of the Community), the intensity, and the quality of friendship between the members of Community, the discursive and scientific concerns and the collectivity of action of the members of the Pythagorean Community. The fact that the Pythagorean movement had such a character from its inception can hardly be doubted. Concerning this, we can say that the Pythagorean organisations were associations that had the form both of communities and societies, the members of which accepted certain common beliefs and followed a distinctive, yet eminent11, way of life. III. What then were the Pythagoreans’12 beliefs and views and what do we know of the personality of the Founder and leader of the Pythagorean Community? The answer to this question, as might be expected, gives rise to a multitude of arguments. Here, however, we will refer as briefly as possible to the main points of the matter. According to all the testimonies, early and later, Pythagoras, who was from a distinguished and wealthy Samian family (his father Mnesarchus, was a maker of seals), was a gifted personality with many physical, psychic and intellectual talents. Similarly, Herodotus15, Plato and Isocrates16 acknowledged him as a most distinguished wise man. In general, we can say that Pythagoras enjoyed general recognition and respect not only from his followers and the members of his Community, but also from the others. In fact, with the passage of time, mythical and divine characteristics began to be attached to his personality and following his death, there undoubtedly begins a process of elevating him to the status of a demigod, since, as Aristotle writes and Iamblichus relates, according to the secret Pythagorean logos17, included among the rational beings are beings such as man, God and Pythagoras. Particular praise is given to the advanced learning and knowledge of Pythagoras and the Pythagoreans in the fields of mathematics, music and astronomy18. Furthermore, Pythagoras’ vast experience concerning matters of the daily life and moral practices of the political community were never doubted. Such then was the enlightened and charismatic personality of Pythagoras, the philosopher from Samos, the Apollo of the Aegean and the founder of the civilization of Magna Graecia19. According to both early and late sources, the main doctrines and the ideas of the Pythagoreans may be summarised as follows: The principles of all things are limit, the unlimited and numbers20. All animate beings are regarded as homogenous21. Man has a dual hypostasis: his soul is immortal, while his body is mortal; his soul follows certain cycles of births and reincarnations22. It can be saved, if purified by following a certain way of life, in which the major role is played by science and the principles of Pythagorean philosophy. Purification, which according to the Orphics was connected with the idea of metempsychosis and is accomplished through various sacred rites is achieved by the Pythagoreans chiefly through the cultivation of mathematics and music23. The cultivation of mathematics and music constitutes the nucleus Pythagoreans’ scientific activities. Concern with the sciences must be continual; no man is wise, but he can become a lover of wisdom.24 An ethical life is desirable in itself, while virtue is achieved through education and, in general, through practice. Man’s life must be governed by harmony, balance and measure; man is a .microcosm, while what surrounds him, the universe, is characterised as cosmos. The form of education that has as its aim an ethical life demands that man live a distinct way of life. Justice is the foundation stone of the political community, and the political: community is well-governed when the principles that prevail in it are those of meritocracy, equality, freedom and justice. These principles secure unity, order and harmony in the political community. The rulers of the state must feel and act as servants to the citizens and it is their duty to put the general good and the interest of: the state before their own interests. IV. It would appear that these ideas governed the Pythagorean society from its inception, and they must have been formulated to a large extent by Pythagoras himself before settling in Croton in southern Italy. This follows from the fact that no community can exist and function that demands of its members obedience to certain rules and, that they follow a certain way of life, without having defined in general terms and tried out in practice not only the rules but also the validity of the proposed way of life. Of course, this does not exclude the further elaboration of the early Pythagorean ideas, since the Pythagorean doctrines by their very nature consisted of principles that constituted a wide programme of research and were open to interpretation. All the members of the Community could participate in this programme, but in practice this was not possible. For there is a great difference between wishing to research into something and successfully completing a research programme. Naturally, Pythagoras does not appear to have believed in some all-leveling theory concerning human nature and the capabilities that men have during different stages of their lives. He saw that men are differentiated in accordance with their actual mental and physical capabilities. He accepted that men are differentiated primarily in relation to difficult tasks, and especially research tasks, that they gave to accomplish. Thus, as later testimonies show, he was forced by the facts not only to evaluate, but also to differentiate his followers25. It is obvious that such a differentiation among the members of the Pythagorean Community, despite the initial existence of the evaluation and respect for the talents of each person, could not take place during the first stage of the activity of the Community in Croton, unless we accept as correct the hypothesis that the Pythagorean Community had already operated in Samos in the same way and with roughly the same structure that it later acquired in Croton. The fact that some form of Pythagorean School operated in Samos before Pythagoras left for Italy appears from what is said by Porphyry26 and Iamblichus27, who stress that even in their time, this School was called the «Semicircle» (Ημικύκλιον) 28 of Pythagoras. Of course, we are not obliged to accept this information as correct, before it is substantiated by other testimonies, but perhaps it contributes to the view that Pythagoras, before leaving Samos, had undertaken scientific and philosophical activity there. Irrespective, however, of Pythagoras’ activities in Samos, we are correct in accepting later information concerning the internal differentiation of the members of the Pythagorean community. The internal structure of the Pythagorean Community, according to Porphyry29 and Iamblichus30, was as follows: the followers were divided into mathematicians and acousmatics (or mathematicians and listeners). The mathematicians were those who concerned themselves with mathematics, geometry and astronomy, in other words, who busied themselves to a greater extent with scientific matters. The acousmatics were all those who heard only the summary headings of the Pythagorean teaching, without any fuller or more explanations being given. According to the Anonymus Photius, the Pythagoreans were divided into the revered 32, the mathematicians who engaged in mathematics, and those who were concerned with the human problems of everyday life, who were called the politicians33. Furthermore, according to Iamblichus and Photius, significance is to be given to the distinctions between those associated with Pythagoras himself, who were called agones or Pythagoreans (or esoterics)34, and those who were outsite supporters and imitators of the Pythagorean doctrines and were called pythagorists. It is extremely likely that the pythagorists were a further subdivision of the category of acousmatics and outside followers and that such a distinction must perhaps appeared later, in Post-Parmenidean Pythagoreanism. Without doubt, however, the original structure of the Pythagorean Community, despite the equality of its members, and the community of goods that could exist at least between the inner members or the close associates of Pythagoras, is hierarchically organised according to knowledge and, in part, function, since there was a different status for those concerned with mathematics and philosophy in comparison with those concerned with the practical and daily problems of living35. Concerning the question of the existence or not of common ownership among the Pythagoreans and their residence in a common house so as to constitute some form of coenobium, apart from what is said by Porphyry36 and Iamblichus37 concerning the common house (which in effect was an entire city, the inhabitants of which had their goods in common with the relations between them being governed by Pythagorean legislation), we possess no other valid testimonies. The fact that the Pythagoreans of Croton did not live in a coenobium or ceonobia is concluded indirectly from information that is beyond doubt and which refers to the attacks against the Pythagoreans that took place at the time that they were in meeting38. If, then, some form of communal ownership or communal life had existed, this must have concerned initially only a small number of members of the Pythagorean Community. From this point of view, it could be said that the Pythagorean Community did involve a form of communal living. From the point of view of its content, the Pythagorean Community had an ascetic character, though it cannot be equated with a monastic, religious brotherhood. However, despite the fact that there may have perhaps existed a limited community of goods among the members of the Pythagorean Community, the distinctions in terms of abilities and knowledge did not cease to exist even in this case. It was, then, a community or society, internally structured according to merit and ability, the main aim of which was the organisation of the political society and the cultivation of science and philosophy which leads man to redemption. The fact that the Pythagorean Community had from the beginning scientific and philosophic aims is something which is beyond doubt. Yet concerning the political aims of the Pythagorean Community, we do not, of course, have any early testimonies. Beyond doubt, however, is the fact that the Pythagoreans involved themselves more than any other group in the political affairs of Magna Graecia, not only as individuals (as, for example, in the case of Archytas), but also as a community and as a group. Moreover, what primarily characterises the Pythagoreans in contrast with contemporary .or later philosophical goups is collectiveness. The nature of collectiveness in the Pythagorean Community is something unique; the obscuring of individuality and the prevalence of the collective spirit indeed constitutes a new situation within Greek society. This fact is even more surprising and notable if we take into account that this obscuring of the individual extends even into the field of research and truth. One wonders whether the principle of secrecy that obscured the creative presence of individuals was indeed a strengthening and motivating factor for those earnestly engaged in research, or perhaps the opposite principle would have been more effective and more in keeping with the rightful wishes of creative people. It is my opinion that secrecy does not constitute a strong motive for research, nor does it necessarily strengthen the collectiveness which is undoubtedly necessary in the carrying out of long-term research programmes, though some form of non-communicating to others must characterise the conduct of the members of a research team. This, however, is a long way from the strict, absolute and total silence imposed by the rule of secrecy. What can we say about the case in question? Why did Pythagoras lay down the strict rule of secrecy concerning scientific work? For what reason did he wish the truth to be hidden under a bushel? 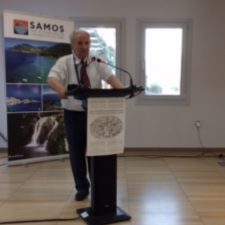 V. The view put forward here is that the Pythagorean Community had primarily a political character and that this was not created in Croton but was conceived as an idea and formulated for the first time in Samos. The fact that he projected his scientific and philosophical teachings outwardly was in keeping with the activity of the Community in the existing situation in Samos and with the tactics that Pythagoras and his associates were obliged to follow in Samos which for such a long period was under the tyrannic rule of Polycrates39. There, Pythagoras and his companions, in opposition to of tyranny, developed their secret community, which had as aim to overthrow this state of tyranny. Moreover, it is obvious that Pythagoras and those around him; would give to their community above all a philosophical and scientific veneer. Initially, this group could function without fear as a gathering of individuals, interested in philosophical research. No difficulty would arise for Pythagoras and his followers simply on account of the fact that they cultivated science and philosophy; the only danger that might arise would be from the position that the Polycrates adopted in connection with this movement. The tyrant’s disposition towards the Samian philosopher might have been hostile either because he did not agree with Pythagoras’ teachings and their effects, or because he discerned some immediate danger to his rule. In the first case, he might either forbid Pythagoras’ activities or influence the citizens so that they would be indifferent to the teaching of the Samian sage, since he believed that this constituted a direct or indirect check on his power. The fact that the Pythagorean doctrines concerning life and ethics were not in accord with the ideas of the tyrant is something that needs no further analysis. In the second case, he could either punish Pythagoras, putting his life in danger, or exile him, or simply force him to go into self-imposed exile. It is more likely that a tottering and harsh regime adopted the most severe policy. More than anyone else, Pythagoras could analyse the situation and understand the conditions in which he was obliged to work. For this reason, it seems that, in the face of the danger he was in, he preferred clandestine activity against the tyranny. Certain of his doctrines would, of course, be put about in public so as to attract the attention of the Samians. Apart from this, it seems that Pythagoras selected from his wide circle of listeners those persons who had all the talents to become his companions in struggle for the ethical rehabilitation of Samian society and who would work towards the overthrow of the tyranny. And it was on individuals who were his close associates and followers that he imposed the rule of secrecy, so that his activity and plans might not be learned by others and, of course, by the tyrant. It would appear, however, that either the tyrant realised what was going on, or he was wise and experienced enough to see in time the outcome of Pythagoras’ activity and teaching, and he acted correspondingly, so that Pythagoras and his associates were forced to leave Samos. The fact that Pythagoras was forced to leave Samos follows from the logic of the situation. And the fact that he was forced to leave because of his opposition to the tyranny is testified to by Porphyry. The logic of the situation says that you do not readily abandon your homeland, and at a mature age (Pythagoras then must have been between 45 and 50 years’ old), being a distinguished citizen of the place, to set out for other unknown lands simply because you are fired by an intense philosophical disposition and by the zeal of the moral and social reformer. From this point of view, the testimony of Porphyry, who claims that Pythagoras left for Italy because of Polycrates’ tyranny, which began to become more organised, that is, more harsh and unyielding, corresponds, as we said, to the logic of the situation. The thing, however, that the Neo-Pythagorean thinkers could not ask themselves was to what extent it was necessary for a scientific community to have a secretive character, not only in the sense of giving a religious colour or halo to scientific knowledge, but in observing a rule that strictly forbade anyone else other than members of the Community to participate in scientific truth. This is made even more strange, when the scientific researchers are forbidden to communicate their scientific achievements to the outside world. The view that, if these scientific and philosophical doctrines are communicated to others, they lose their value, is undoubtedly a primitive view and is not in keeping with the rationalism of early Pythagoreanism which is closely linked with the cultivation of mathematics and scientific thought. VI. Moreover, despite the fact that Pythagoreanism has common features with Orphism and has assimilated many elements from the religious and religiously primitive life of the Greeks, it cannot however be characterised as a mystery religion, nor as a movement rivaling the religious beliefs and polytheism of the Greeks. For what reason, then, would Pythagoras, that Hyperborean Apollo decide to impose a totally factitious, narrow-minded and extremely limiting rule, as was the rule of secrecy in the form we described, on his scientific group? It is without doubt difficult to find a convincing answer to this question, unless we accept as correct the hypothesis that the Pythagorean Community was originally a socio-political group whose activities began in Samos. The secrecy of the Pythagorean group, therefore, had a political cause; it was a secrecy of a conspiratorial nature which characterises all those organised groups that act in secret against some opposing rule or against powerful oppressive regimes. The members of these organisations have to know things that it is not at all prudent for anyone outside the group to learn. Those outside the Community must be excluded not simply on account of the fact that they are uninformed or members of the populace, but simply because they do not belong to the group. The Pythagorean community, then, initially, that is, when it was first organised in Samos, had such a character. Only such a hypothesis can explain the further course and outcome of the Pythagorean Community. VII. If we accept this view, then Pythagoras appears to have sought refuge out of necessity, together with his associates as an organised group, in Croton perhaps because he had some ties with the people of Croton. What is sure is that he did not go alone, because then it cannot be explained how on his own he would find the time and the will to set up his Community from the beginning, to find those individuals who would give it life, nor can the fact be explained that the Community managed in a relatively short space of time to acquire enormous influence in Croton and throughout southern Italy. The Pythagorean Community would continue its activities in Croton in a secretive way. The secrecy surrounding the activities of the members of his group is what, in part, linked Pythagoras’ endeavours with the Orphic movement and, in addition, afforded it great advantages and strong possibilities of overcoming any difficulties that might arise in the new environment in which it had to operate. Experience had taught Pythagoras that small but secretly and well-organised forces could have great results. Thus, on the one hand, the Orphic tendencies and ideas that existed in his Community and, on the other, the advantages afforded to his group by his clandestine activity and his conviction that silence was an essential element in collective endeavours that have as their aim social reform and the carrying out of long-term research programmes, seems to have motivated Pythagoras into maintaining the secretive character of his Community in Croton, despite the fact that his hew homeland was governed democratically and was a free and open, to say so, city-state. If now it is supposed that Pythagoras left alone and without companions, and that he decided alone and for the first time to establish his Community in his new homeland, and there to promote his work of reform and develop his activities, first of all his endeavours would not have led to the results that his Community achieved in such a short space of time, and secondly he would have been obliged to take into consideration the new conditions in which he had to work, which, as the course of his Community shows, he does not appear to have given attention to. Without doubt, he would have had to reform many aspects or, at least, certain fundamental aspects of his organisation, which he does not seem to have done. Thus, finding himself by force of events faced with a new situation, and obviously endeavouring to secure the widest possible influence over affairs in Croton and taking into account both his time of life and the brevity of man’s life, he did not consider reforming the nature of his Community. On the contrary, because of the favourable response of the public to his message of reform and on account of the wish of many to join his scientific and political community, he was obliged to make the structure of his group more rigid and the selection process for new members of the Pythagorean community more severe. Thus, with the passage of time, a secret association that has the form of a community or society grows rapidly in the democratic state of Croton. And as there were no external dangers to the Community or its members, the Pythagoreans made their political aims more clear and no longer concealed the identity of the members of their Community. They succeeded in prevailing politically not only in Croton, but in other cities in Magna Craecia. Pythagorean political theory and the Pythagorean ethical life undoubtedly exercised a great and beneficial influence in Croton. The political involvement of the Pythagoreans constitutes a new concept concerning the governing of the state other than that of a tyranny or totalitarian demagogy. It is a politics that is based on equality, justice, freedom, merit and harmony. What is significant is that in the case of the Pythagoreans, these principles are supported the coordinated activity of a collectively and decisively active community of responsible persons, organised according to merit. It appears that the Pythagoreans through their Community made the first theoretical and practically coordinated attempt to organise the political life of the Greeks on a firm basis of collectivity. For this reason, without it ever being possible to conceive of the Pythagorean Community as distinct from its scientific character, nevertheless on account of the cause of its creation and because of the fact that its founder desired to reform the ethical and political life of people through the establishing of a new way of life, the acme of the Community’s activities during the last quarter of the sixth century, for example, was of a political and social nature. VIII. It remains now to examine the question of what was the relationship between the Pythagorean Community and the wider socio-political environment, what forces appeared and situations arose during its course and why were there attacks and uprisings against it, leading to its downfall. The Pythagorean association in Croton, seen either as a community or as a society, in essence constituted an unusual organisation of a section of the population of a certain society that by its nature and in its operation is a free, democratic and open society. The Pythagorean Community, despite the fact that its members acknowledge the principles of equality, justice and freedom, is from another point of view, a closed community or society4. It can be characterised as closed because of the prevalence of the rule of secrecy, that governed the conduct of the members of this community. Thus, the Pythagoreans, because of the force of the rule of secrecy, are individually and institutionally cut off from the social whole. Perhaps what we have here, then, is the first case of an interrelationship between an open and a closed society. The Pythagorean Community as a closed society is naturally a part of the .wider society. However, looking at things from another point of view, because the Pythagorean Community sought to regulate the political and social affairs governing the entire free political society, what happens is that the open society becomes subject to its leadership and to the rules that the closed society institutes for the city, without the city having any say in the institution of these rules or in its own affairs. And from this point of view, the Pythagorean Community is a closed society. Thus, between the Pythagorean Community, seen as a closed society, and the open democratic political society, there smoulders right from the beginning a prospective clash. This clash has a theoretical character, but it can become active and break out under the right conditions. In Croton, such conditions did come about precisely when the problem arose concerning how the rulers of the state should be elected and who should have the main say in this 40. A closed society like the Pythagorean Community seeks always to limit the right to choose the rulers or the candidates for leadership, while an open society, when it realises that operating within it is some other closed system of social activity that wishes to appropriate the leadership for itself, is radically opposed to these tactics. Moreover, the reactionary opposition felt by the citizens of a free state towards those who form factions, act in secret and, above all, promote their own views and affairs, will eventually show itself. And this is what in fact happened in Croton, where twice it is testified41 that there was a clash between the closed and the open societies. This clash, as we said, is unavoidable when the small closed society puts forward the claim to regulate the affairs of the open democratic society, without itself accepting the rules and being subject to the principles that prevail in the wider socio-political framework and without it giving account to the social whole about which it is concerned and interested. The testimonies that have come down to us from Dicaearchus, Aristoxenus, Diodorus, Iamblichus, Porphyry and Polybius talk of uprisings against the Pythagoreans and of setting fire to their Meeting Places. The second great attempt against the Pythagoreans was universal and even Iamblichus (Life of Pythagoras, 35, 248ff.) relates that the reason for the clash were political, strengthened by jealousy suspicion of the Pythagoreans because of the secretive nature of their doctrines. Nor again was it fortuitous that after Philolaus (who in effect abolishes the rule of secrecy), Archytas, the distinguished Pythagorean politician from Taranta is elected continually and democratically to the highest office of state, precisely because he was a worthy and able politician and because there was no cause for any clash between the individuals professing the Pythagorean doctrines and the open democratic society. It should appear that Philolaus was the first Pythagorean who understood the logic of things and diagnosed the causes that led to the clash between the Pythagorean Community and its social environment. IX. If then the endeavour of Pythagoras and the Pythagoreans was to reform the moral and political affairs of Greece, this could not take place without their political intervention. In order for this intervention to be effective, it could not simply consist of proclaiming certain principles, but it had to be backed by the activity of worthy and irreproachable individuals whose actions would receive collective support. The Pythagorean Community was such an endeavour. However, the collective attempts at reform and rehabilitation did not succeed in a situation where a tyrannic regime prevailed and flourished. For this reason, Pythagoras gave to his group from the very beginning a secretive character and, as a true philosopher, linked his political aims to his broader metaphysical, anthropological and cosmological doctrines. What Pythagoras ought to have done after going to Croton was to reform his Community, so that its activities might correspond to the wider framework in which it sought to act. This mistake, of course, can be explained. But when it happened, it proved fatal either because it led to a clash between a closed society and an open state, or because it led to a clash between a closed system and the wider open and democratic society of the world around. From this point of view, the decline and fall of the varying forms of closed regimes that come into conflict with the principles of equality, freedom, the free exchange of ideas and democracy that prevail as powerful forces strongly colouring the wider socio-political framework, must be seen as unavoidable42, since these regimes wish to leave open some channels of free, that is, non-controlled, communication with the wider framework in which they exist. And this is why our reference to the creation, development and downfall of the Pythagorean Community acquires a highly topical character, since this shows not only the profundity of the early and intense socio-political thought of the Greeks, but also the predominance and value of the ideas and institutions behind the great, liberal and open democratic society to the establishing of which the Pythagoreans contributed with their thought and their consistent way of life. 1. Iamblichus, Vita Pythagorae, 177-249, Porphyry, Vita Pythagorae, 54, 56, Plut., De genio Socr., 13 (583a). 2. Porph., V. P. 18. 3. Polyb., II. 39, Iambl., V. P., 45, 249. 4. Clem., Stromateis, V. 58. 5. Iambl., Protrepticus, 7, 14-15, 8, 3-6, 124, 24, See also Dominic I. O’ Meara, Pythagoras Revisited, Clarendon Press, Oxford 1989, p. 32. 6. See Isoc., Busiris, 29, Iambl., V. P., 31, 199, Porph., V. P., 19, 58, Diog. Laert., 15. 7. See Iambl., V. P., 72. 8. That the Pythagorean way of life was something public, a praise-worthy conduct and a notable way of life appears from what Plato says in the Republic (600a). 10. Porph., V. P., 20, Iambl., V. P., 29-30, 93, Diog. Laert., VIII, 10: «κοινά τά των φίλων». 11. See Plato, Republic 600a. Plato praises Pythagoras’ contribution to the formulating of the Pythagorean way of life. 12. Aristotle calls the members of the Pythagorean Community «The Pythagoreans», «The so-called Pythagoreans», «The Italians» and «Those in Italy» Met., 985b23, 987a9, 989b29, 1080bl6, De Caelo B 13 293al8. See also H. Chemiss, Aristotle’s criticism of Pre-Socratic philosophy, Octagon Press, York 1971, p. 37. 13. Though disagreeing with Pythagoras, Heraclitus recognises his great learning ( DK B 40 and 129). 17. Iambl., V. P., 31. 19. See Iambl., V. P., 29 (166). 20. See W. K. C. Guthrie, A History of Greek Philosophy, I, pp. 181-226. 21. Porph., V. P., 19. 22. Guthrie, op. cit., p. 186, 202, Porph., V. P., 19. 23. Guthrie, op. cit., p. 204. 24. That is, seekers and lovers of wisdom, which is understood as an attempt to constitute a theory concerning the cosmos and as an indication of a way of life that will lead man to salvation. 25. Iambl., V. P., 88. 26. Porph., V. P., 9. 27. Iambl., V. P., 25-26. 28. If the information is not valid, then perhaps what we have is some place or public building that was constructed and later called «Ημικύκλιον» in honour of Pythagoras. If, however, there is some trace of truth in this information, based on the shape of the place or building (semi-circle) and relating this information with what Herodotus says (III, 141-149) concerning the taking of power by the tyrant Maiandrios «ές μέσον», (III, 142) it seems that the political gatherings of the Samians took place in a circular or semi-circular area (which perhaps had the shape of the orchestra of an ancient theatre). It is quite likely that Pythagoras would have taken part in such meetings (See Iambl., V. P., 28). 29. Porph., V. P., 37. 30. Iambl., V. P., 72, 226. 31. See P. Thesleff, The Pythagorean Texts of the Hellenistic Period, Abo Akademi 1965, p. 237. 32. This distinction is without doubt later and perhaps corresponds to the state of the Pythagorean Communities in the Hellenistic period. 33. Apart from the politicians, there were also other categories according to Iamblichus, such as the lawgivers and the economists, and those who took care of the affairs of the common house (Iambl., V. P., 72). 34. Iambl., V. P., 72. 35. It is easy to understand that later social and political matters acquired priority; this evaluation might take on another form. This is clear from Dicaearchus’ practice of praising the socio-political aspect of Pythagorean philosophy. 36. Porph., V. P., 20. 37. Iambl., V. P., 30. See also Iambl., V. P., 18 (80), where it claimed that communal ownership of goods did not apply to all the members. 38. Plut., (DK, 44, 4a). Iambl., V. P., 249 and Polyb., II. 39. 39. This hypothesis becomes more convincing if we take into account what Barron says concerning the existence of two men with the name Polycrates (Polycrates the first and Polycrates the second) who were tyrants of Samos. (See J. P. Barron, «The Sixth-Century Tyranny at Samos», C. Q., 1964, pp. 210-229, and K. Boudouris, Pre-Socratic Political Philosophy, Athens, 1988, pp. 29-57) and the second of whom, as the whole situation in the Samian state worsened, began to weild harsh tyrannical power in order to maintain his control of affairs. Relating to this, see K. Boudouris, op. cit., pp. 52, 56-7. 40. Iambl., V. P., 257. 41. See Iambl., V.P., 248ff and Polyb., II, 39, 1-4. See also W. K. C. Guthrie, op. cit.,178-180. 42. It is not fortuitous that the uprising against the Pythagoreans happened at least twice at different times and for the same reason, that is, around 508 B.C. and around 450 B.C.